COOPERATIVE PRINCIPLE #2: DEMOCRATIC MEMBER CONTROL. Cooperatives are democratic organizations controlled by their members, who actively participate in setting their policies and making decisions. 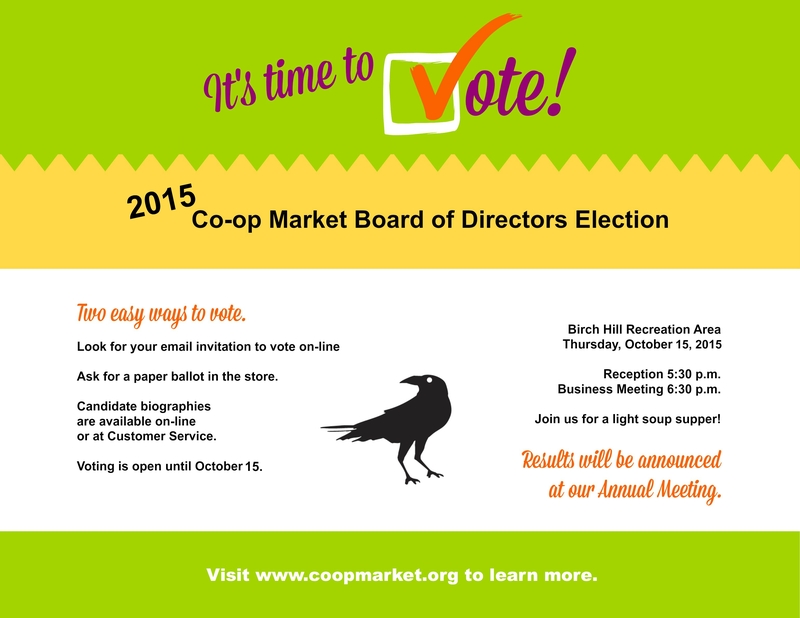 Every year, our Owners help shape the future of our co-op by voting for a Board of Directors. In 2015, we have five open seats on our nine-member board. The ballot also includes Owner confirmation of one director who was appointed by the board to fill a vacancy. This year, Owners also have the opportunity to approve amendments to our bylaws, which have not been updated since they were adopted in 2011. Bylaws are the written rules that govern our co-op. They are a legal document that sets forth the structure of the board and co-op, determines the rights of our Owners and the procedures for exercising those rights. Bylaws guide our board in conducting business, ensure fairness and provide legal protections. You can view both the amended bylaws and the original version adopted in 2011 by clicking here. 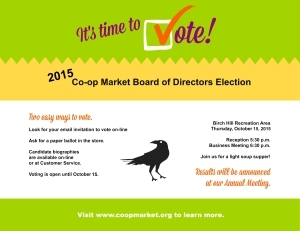 Voting is your right and your responsibility as an Owner of Co-op Market. Last year we offered our Owners the option to vote on-line for the first time. Electronic voting was a great success, so we’re doing it again this year. If we have a valid email address on file for you, you should receive a link to the on-line ballot via email. Click here for helpful suggestions on how to vote electronically. If we don’t have your email address, we will send a paper ballot via the USPS. Paper ballots are also available in the store, or click here to print your own copy. The deadline for voting is 5 p.m. October 15. Election results will be announced that night at our Annual Meeting at Birch Hill Recreation Area. THANK YOU FOR INVESTING IN OUR COMMUNITY-OWNED GROCERY STORE – AND FOR HELPING GUIDE IT! Our First Annual Meeting was held at Pioneer Park’s Civic Center in the theater. It began with Rep. David Guttenberg from the 26th Alaska State Legislature presenting an Honorarium to David L. Lacey who founded the FCCM. Dave’s son, Vaughan, was there to accept the honor. Cora Kelley made a power point presentation of the Co-op’s founding and goals for the health of our local community and the environment. The Agenda was presented and Cora made a motion for approval. Hans seconded. The motion was approved. Mary Christensen announced that we now have 1,005 members. Since 136 were present, we had a quorum. Present on stage were Hans Geier, Rich Seifert, Mary Christensen, Sharon Alden, Helen McLean, Cora Kelley, Mike Emers, Morgan Macchione, Rand Petersen, Rob Leach, and Lela Ryterski. Each person introduced themselves to the audience (general membership). Rob, as the Interim Chairperson, reported on what the Co-op had been doing to develop a business plan and connect with local producers. TREASURER’S REPORT: Sharon reported that since our founding we had collected $37,000. Of that $10,000 went to the feasibility study, $2,800 was advertising, $1,600 for printing, and costs of goods was $1,800. We presently have $20,520 in the bank. COMMUNICATIONS/OUTREACH: Mary reported that we’ve worked hard to have a successful Harvest Fair/First Annual Meeting which serves as a kick-off for a membership drive to realize 500 full members by November. PRODUCTS/VENDORS COMMITTEE: Lela gave a synopsis of what had been occurring: finding vendors, developing criteria for products. FINANCE COMMITTEE: Hans gave a synopsis: We’ve connected with a co-op bank. STORE DESIGN: Rob reported we’re considering a section of the old Foodland Building. BUSINESS PLAN: Rob explained how all these committees together will develop the business plan. ADOPT BYLAWS: The copy of the Bylaws that was sent out to the membership had not yet been looked over by a lawyer. Two days prior to this meeting the core Board Members met to approve and update the editing done by the lawyer. Copies of this new edition were available at the door. Rob was at the podium to act as parlaimentarian. Dan Hancock moved to substitute the old bylaws with this new edition. Mary Stech seconded. Rich Seifert didn’t want to approve without reading the corrections. Rob went over the basic changes. It was voted on, and the substitution passed. Ben Birtles made a motion to adopt the new bylaws. Bett Schaffhauser seconded the motion. Discussion ensued. There were questions about founding members verses regular membership, and how often the Board meets. There was a call for a vote, and the Bylaws were adoped. ELECTION OF NINE BOARD MEMBERS: As we opened the floor to address the election, a member made a motion to amend the Bylaws to include eleven Board members instead of nine. However, since we just voted on the Bylaws, this concern would have to be addressed at the next meeting of the membership. We moved on to the election. Nominations from the floor were accepted. Lela nominated Vaughan Skylark. There was a move for nominations to be closed. It was seconded. All were in favor. Votes were placed into a closed box on the stage. MEMBERSHIP FEES: $200 was proposed for full membership. Discussion ensued about the amount, and concern that time payments would be untimely for funding our project. The criteria for payments was left for the Board to decide. A motion called for a vote. It was seconded. A vote passed the $200 membership fee. The floor was opened to Members’ Comments: there were none. Cora moved to adjourn. It was seconded. All consented. The meeting was adjourned at 5:00 p.m. Present were Mary Christensen, Rob Leach, Lela Ryterski, and Ian Olson. The minutes from the previous meeting were read and accepted. COMMUNITY/OUTREACH: Mary reported on the June 2nd meeting. Three new members came to that meeting: Shawn Lott, Sue Sprinkle, and Jackie Sunnyboy. Also present were Tom Bradley, Lela Ryterski, Mary Christensen, and Sharon Alden. Mary informed the group that they were responsible for the initial membership fundraising since the fact that we could raise, among ourselves, a substantial portion of funds needed to begin operations would legitimize the co-op as viable and make it easy to receive other monies from matching grants and bank loans. Mary suggested we shoot for a goal of $100,000 by November. Five hundred people investing the proposed one-time $200 membership would satisfy that goal. The next newsletter will focus on the money issue. Mary and Sharon went to Risse’s Greenhouse on Saturday and got a few names. Tom and Lela went to Clucking Blossom and got several more names. Mary suggested that if we all got on the co-op’s Facebook and each invite 6 people to join, we could be reaching thousands of people with one notice. Twitter is set up. Sharon did the Pay Pal and Dru is working on the website to incorporate all aspects. Partners in Business is in progress. Other member equity: turkey dinner, calendar, fancy dinner at a producer, cookbook, coupon book, buttons, t-shirts, bumper stickers, tiles honoring big donors. Sue is working up a membership poster. Next Communications Committee meeting will be next Tuesday, June 9th, at Mary’s at 6:30 p.m. Interested persons can go to themagiccarpet@gci.net and ask for directions to Mary’s house. LOCAL PRODUCERS: Lela is contacting potential suppliers. Ian mentioned reindeer processing from a mobile unit at the university. He’ll look into that. STORE DESIGN: Rob is the new chair. BUSINESS PLAN: Robert Sullivan has material and is getting geared up, reported Rob. FINANCE: Hans is out of town. Mary contacted two insurance companies and gave Rob the findings. PRODUCT SELECTION: Lela spoke to Shawn Lott about being on the committee. TREASURER’S REPORT: Lela reported that Sharon put a member’s donation in the bank and paid the phone bill. OLD BUSINESS: The Bylaws got sent to the lawyer. Lela sent Deirdre the revised copy to replace the one on the blog. Rob is sure it will need another revision. Pot luck dinner for volunteers to inventory the Foodland building and choose which committees they would like to work with. Bring flashlight and work clothes and a digital camera. Event pushed back 3 weeks to allow enough time to get the word out. Delta Farm Bus Tour in mid-July. Communications Committee to advertise for other health education events in our newsletter. Rob is scheduled to speak at the Farmers’ Market Board Meeting on June 17th at 5:30pm. Other board members are welcome to join. COMMITTEE DESCRIPTIONS: Rob outlined how the committees work to provide input for the Business Plan: Puts all aspects together—start up costs, growth, working capital, employee training, operating funds, inventory, etc. Product Selection: Needs to develop a statement with a clear criteria for products. Define local produce—meats, fish, Alaska, etc. List products we’re not going to carry, i.e. : tobacco. Set goals for increasing amount of local produce. Store services: coffee bar, juice bar, deli, etc. and future projections. Special events: plant starts, etc. Look at feasibility study and take recommendations. Vendor Selection: Follows criteria for product selection. Health and Wellness Education: Speakers discussing co-ops at the Noel Wein Library or Universalist Church. NEXT MEETING: Thursday, June 11th at 6:00p.m. At the Foodland building. The next meeting of the FCCM will be held Thursday, April 16, at 6 pm at Foodland. Among items to be discussed are the revisions to the bylaws; please come and join the discussion! Present were Rob Leach, Barbara Bradley, Tom Bradley, Hans Geier, Helen McLean, Mary Christiansen, Sharon Alden, and Lela Ryterski. A) BANKING: Since Dave’s passing, we need to assign three check signers. Mary made the motion to have the President, Secretary and Treasurer be signers. The motion was passed unanimously. We also need to obtain Dave’s death certificate for the bank (Wells Fargo). Lela will contact Dave’s son, Philos Whitesky, for the death certificate. B) BYLAWS: We passed around copies of the original bylaws Dave had made up. We went over the bylaws as a group and made changes. The question was whether to offer stock shares or not. According to the Articles of Incorporation, we will not offer shares. We have decided to charge a one-time membership fee. The specifics of a family membership are not clear yet, nor the amounts of either membership category. Rob will bring an updated copy to the next meeting for further consideration. C) WORKING MONEY: Barb and Tom are putting together the booth for the Health Fair. We have decided on a logo which will go on the banner and new brochures. These can be used for future booths. We authorized money to be spent for these items. Rob gave Barb $300 for working capital. When we obtain access to the co-op account, he will be reimbursed. D) OUR NEXT MEETING will be next Thursday, April 16th, at 6:00 p.m. at the Foodland site.